Pinot Meunier (Schwartzriesling by its German Name -totally uninspired) is a grape that rarely finds its way into anything else that sparkling wine, mostly Champagne. In France, at least, it is sometimes a challenge even to locate online a producer or a bottle of still Pinot Meunier. I think this is totally unfair for this delicate yet bold grape, which is much too easily set aside in the shadows of its much more famous and resourceful brothers: Pinot Noir and Chardonnay. Sure, it is one of the three varietals legally allowed to produce the sparkling wine manufactured in the little rural and obscure region just east of Paris known to the locals as Champagne. These varieties even have the right to own a designation when a Champagne is produced entirely from the particularkind: Blanc de Blanc for Chardonnay and Blanc de Noir for Pinot Noir. Sadly, Pinot Meunier receives no designation, as there is no sparkling wine made entirely from Pinot Meunier. By French laws, it was only recently that Champagne producers acknowledged the grape’s cultivation in Champagnes, but it will not find its way by itself in the bottle. It usually offers body and richness, due to higher acid levels than Pinot Noir, which gives brightness and crispness to certain blends, but at the same time it has lower color and tannin levels than its sibling. on its leaves, white and powdery. More inspired, in some French regions it is known as „Farineaux”, or „Müller-Traube” in Germany, „floury grape” indeed. Which is much closer to the nature of the grape itself that the name „SchwarzRiesling” – Black Riesling- which is much more common but totally wrong, since they are two distinct grapes, related only remotely by the high acidity levels. 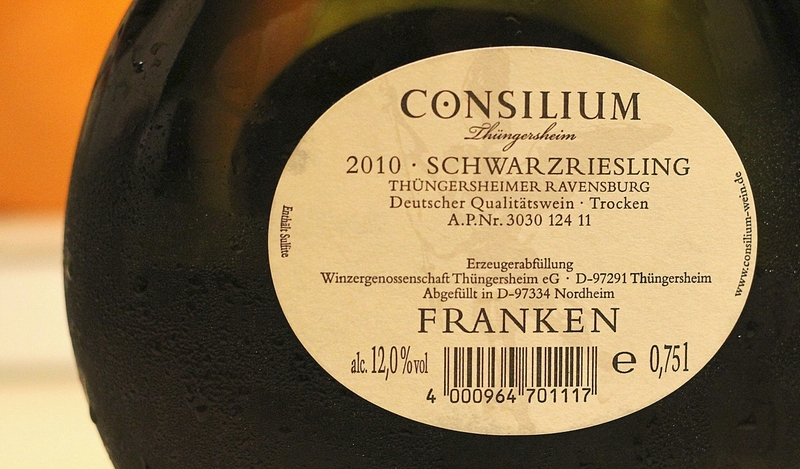 Leaving the name issue aside, I found a spectacular example of this grape’s potential in the bottle of a German weingut –Consilium Thungersheim. This producer from Franconia region (Franken) has a wide selection of whites ,reds, roses and even sparkling wines, utilizing the entire range of native grapes available in the region: Riesling, Pinot Gris, Kerner, Pinot Noir, Zweiglet, and of course Pinot Meunier. The wine comes in the distinctive Bocksbeutel, which I don’t find either attractive nor practical, since it is difficult to fit in the fridge or on a wine rack. 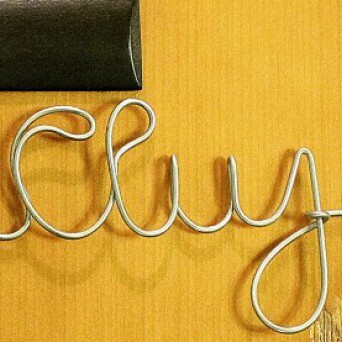 The labeling is, let’s say frugal and diminutive, with little effort put in making the label unique and attractive. Sill, the rounded brown bottle and the golden highlights on the label go nicely together, making this bottle look rather well crafted. 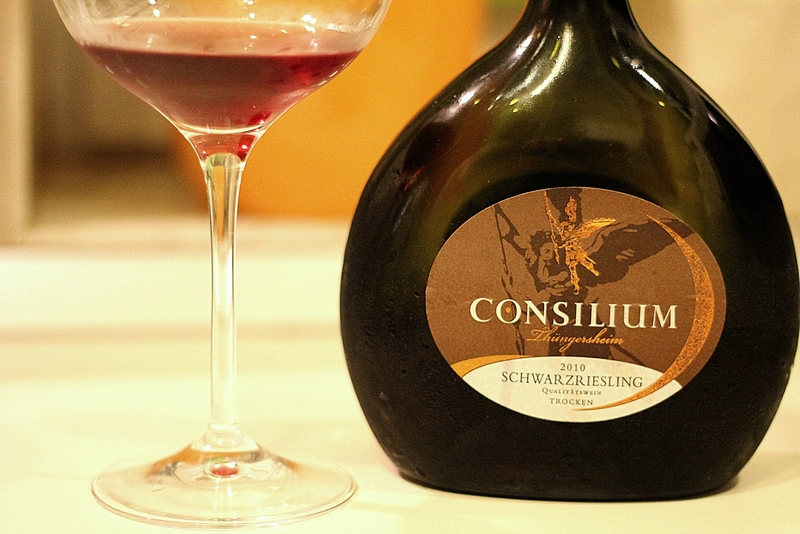 This SchwarzRiesling trocken, Consilium 2010 has the distinctive color of light amber and some darker ruby hues towards the edges, with a nice level of translucence and sparkling. Due to the lower levels of tannins, it has achieved enough depth to be darker than a rose wine, but light enough so you can almost see trough. Actually this beautiful color reminds me of a quality Darjeeling tea. The nose too displays an interesting melange between fruity notes -cherries and cranberries and some smoky, earthy undertones. It seems that this smokiness is typical for Pinot Meunier, and it doesn’t come from oak aging. Nicely blended within the fruits there is also a rather surprising note of blood oranges, hinting to the high acidity levels. In the mouth it is soft yet somehow coarse, feeling like a piece of old velvet. The fruits are intense enough to balance the Riesling-size acidity levels, and the tannin are mild but still pungent. Some new rustic flavors appear -rose-hip, baked aplle and cumin, which give also a nice twist to the powerful acidity. The aftertaste is a little bitter, like black tea leaves. It lacks the complexity of Pinot Noir or the boldness of Beaujolais, being a more simple, straightforward and versatile wine. I loved the vibrant acidity -not so common for red wines- and the rustic, earthy flavors. 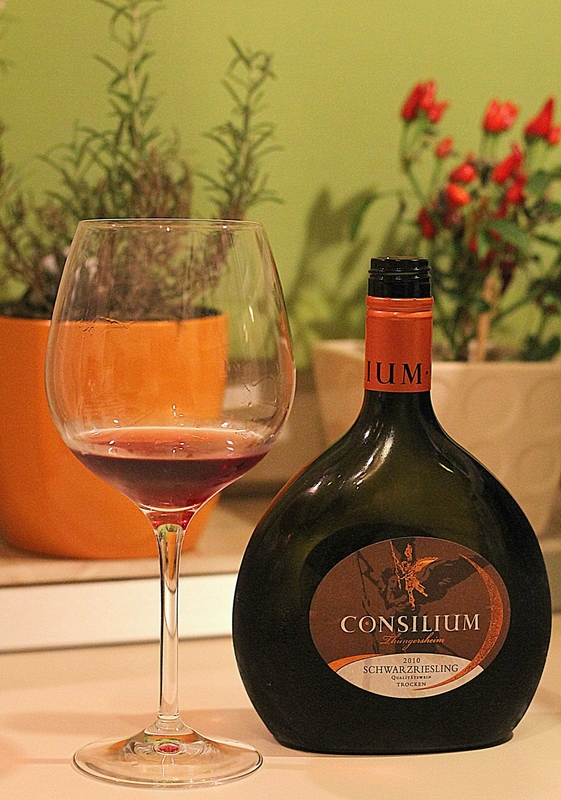 I think it is very drinkable and approachable, once one manages to get over the unusual appearance for a red wine. 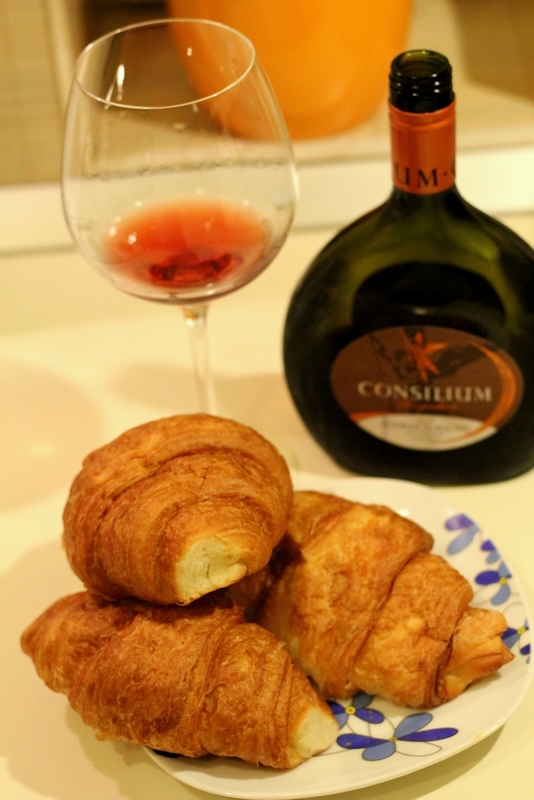 Not so much for heavy roasts and cold cuts, this wine pairs well with pastry and salads. 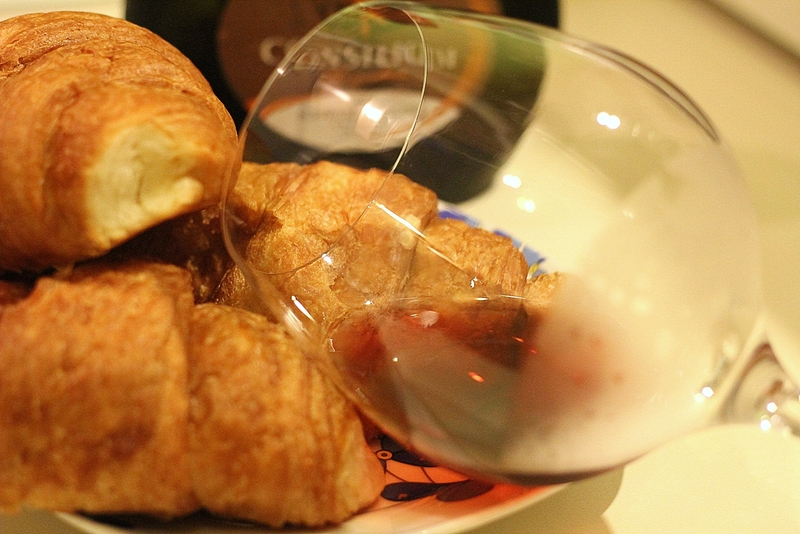 I had a couple of glasses with some butter croissants, an it was a nice snack on a lazy afternoon. Această înregistrare a fost postată la 1 octombrie 2012 de Mihai Oprea în English şi etichetată Champagne, Consilium Schwarzriesling 2010, Consilium Thungersheim, croissants, Pinot Meunier, Pinot Noir, Schwarzriesling.